The Mozilla Firefox browser has garnered wide attention for its capabilities, compared to its predecessor Mozilla and Microsoft's Internet Explorer. But in addition to its widely covered speed enhancements and robust security, Firefox offers a rich assortment of features that are not so evident upon installation. Some of the features are aimed at easing the transition from other browsers. Old habits die hard, and everyone surfing the Net has his share of established behaviours. Firefox allows users to easily migrate old preferences set on other browsers in a few simple steps. By selecting the Import... option under the File menu, one can incorporate bookmarks, passwords, cookies, and other browser-related information used on Internet Explorer, Netscape, and Mozilla directly into Firefox. Catering to those whose major source of information is the web, Firefox can detect RSS (Really Simple Syndication) feeds of Web sites, a means by which content providers offer an up-to-the-minute snapshot of their most recent information. If a site you visit offers this technology, you will observe a small icon in the lower right corner. Clicking on it allows you to generate what is known as a Live Bookmark -- a dynamic directory of links which are generated from a sites updated RSS feed, and which are also stored under Firefox's Bookmarks menu. Another area which has blossomed with the advent of Firefox's final release is its Extensions -- special add-ons developed by third parties that enhance a browser's default capabilities. While toolbars produced by vendors like Google, Yahoo, and AOL are the norm on other browsers, Firefox open source developers have come up with grassroots extensions that fulfill even the most exotic user quirks. If you are an avid Internet music listener, check out the FoxyTunes extension, which will allow you to integrate your media player controls under Firefox's lower frame, streamlining the operation of your favorite player while surfing the Web. If downloading is your thing, the FlashGot extension can handle Net downloads through external download managers, allowing you to reuse your download software seamlessly with Firefox. These are just two examples out of more than 150 available. As an example, let's proceed with instructions on how to configure one especially useful extension -- InfoRSS , which allows you to incorporate an RSS (Really Simple Syndication) feed for delivering headline updates -- into Firefox. After you install InfoRSS and restart Firefox, you'll see a small world icon on the browser's bottom frame. 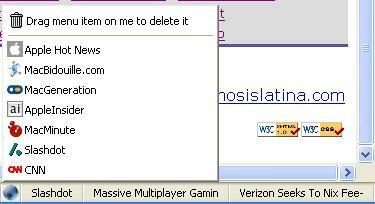 If you select it with your mouse, you will see a list of default RSS feeds from around the Net. You can add an RSS feed into InfoRSS in two ways: You can visit the feed -- as if it were a Web page -- and drag and drop the address onto the small world icon. Or, you can wait for Firefox to detect an RSS feed automatically and add it as a Live Bookmark -- as was mentioned previously. This places the RSS URL into the InfoRSS menu for later addition. Upon placement, InfoRSS will confirm the validity of the feed and later show it within the drop-down list. Themes are another Firefox feature that allow you to modify the browser's look and feel. You can specify if you want to view cleaner-cut smaller-icon menus or special color variants, and you can modify your visual rendition depending on your mood or tastes. You manage Firefox themes from the Themes option under the Tools menu. A small pop-up window will appear, allowing you to install, update, select, and search alternate display themes. All of these are some of the less commonly explored -- although powerful -- features offered by Firefox. With them, you can enhance your browsing experience while using this W3C standards-based browser.